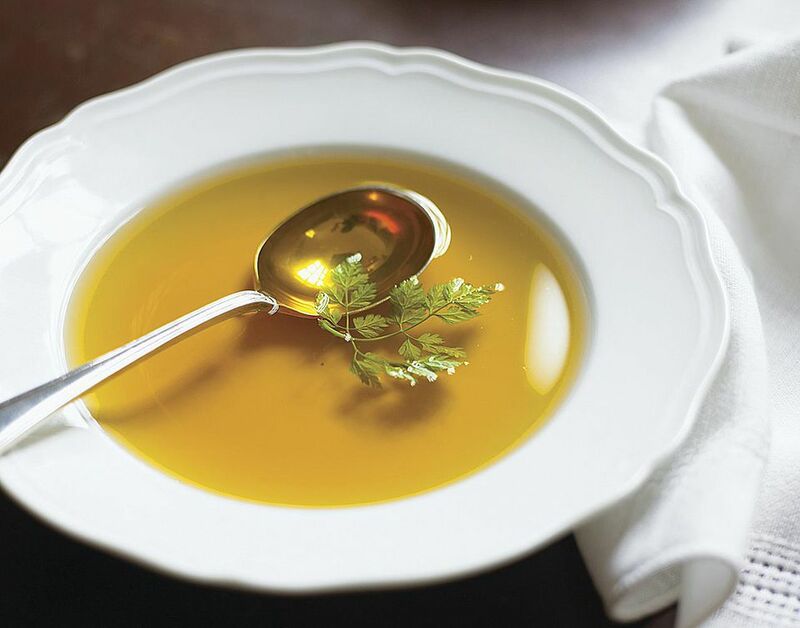 Tomato consommé is more than just a soup, it is a clear broth bursting with flavors from the sweet, summer tomatoes and herbs. You will first need to make the tomato sauce then follow the instructions for clarifying. You will be amazed at the taste. Yes, the recipe takes some doing, but the effort is worth it for the results. Start by adding the water to the tomato sauce and giving it a good stir. In a food processor blitz the tomatoes with the basil leaves. Add the egg whites and sugar and blitz again until all the ingredients are well mixed and pour into the sauce and water mix. Stir well. Place into a large pan and bring to the boil whisking constantly. Simmer the soup gently for 15 minutes, gradually the egg whites will rise to the surface and start to form a crust. Do not disturb this, it is going to act as your filter for the soup to clarify it. Line a sieve with a piece of clean, unused muslin or a tea towel that has been washed in plain water (the taste of detergents can be passed through to the soup), Gently ladle the crust evenly into the sieve. The, ever so slowly ladle the liquid, a ladle at a time over the crust. allow time for the liquid to pass through the crust and sieve before adding any more. Do not push the sauce through! Return the clear liquid to the pan and reheat to hot not boiling. This soup is best served warm to hot (not boiling) as it intensifies the flavor. If not serving immediately, cool the soup and refrigerate until required. Reheat the soup to hot but not boiling and divide between six hot soup plates, garnish with basil if using and serve immediately.